Newman University recognized 23 candidates for the Bachelor of Science in Nursing degree during the fall 2017 Nursing Pinning Ceremony. The event was held Dec. 15 in the De Mattias Performance Hall. During the ceremony, the Newman University director of nursing places nursing pins on the candidates’ lapels as a symbol of their completion of the baccalaureate of science in nursing (BSN) program. 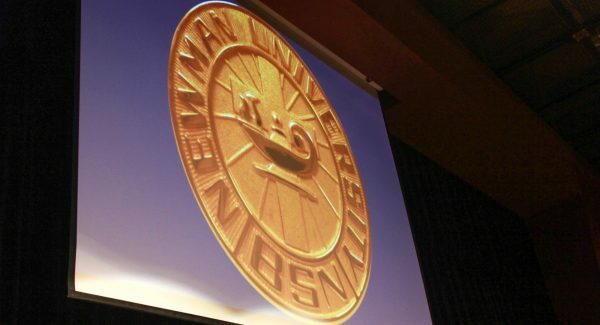 The Newman pin is unique to the university and was designed by the first graduating BSN class in 1984 at what was then Kansas Newman College. The traditional event for nursing program graduates dates back more than 130 years in the United States. Mackenzie Wills offers greetings to those attending the fall 2017 Nursing Pinning Ceremony. The ceremony included a welcome from Newman Provost and Vice President for Academic Affairs Kimberly Long, Ph.D., a blessing of the pins by Newman Chaplain Father John Fogliasso and a brief address by Director of Nursing Teresa Vetter, M.S.N. Students Thu Phan and Bryce Williams gave an address during the ceremony. Both had many memories to share, including anecdotes about their time in the program. Both speakers reminisced about the knowledge they gained, and the important life skills they will take with them. “First semester was about adjusting to the increasing workload and learning to sacrifice,” recalled Williams. Distinguished BSN award recipient Anna Burton (center) poses with Newman University President Noreen M. Carrocci, Ph.D., (left) and Director of Nursing Teresa Vetter, M.S.N. (right). 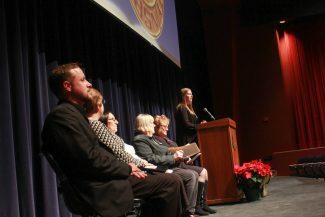 The ceremony included the naming of the Distinguished BSN Graduate Award. 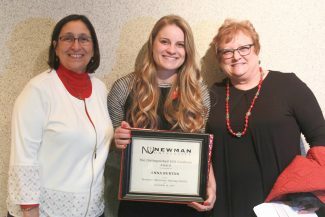 The award is given to a graduating nursing student who has a minimum 3.5 cumulative GPA and demonstrates an exceptional commitment to the nursing profession and involvement in the Newman and greater Wichita communities. The fall 2017 award was bestowed upon Anna Burton of Overland Park, Kansas. Burton was active in Campus Ministry at Newman and excelled in volleyball, recently being named a first-team CoSIDA Academic All-American, one of the most prestigious honors a collegiate student-athlete can receive. Vetter congratulated Burton and reflected on her character. Burton, who transferred to Newman to play volleyball, said she never expected to receive this award. Burton said she will take many memories and skills with her in her life, but the things she’ll value the most are the communication skills and friendships she gained while in the program. 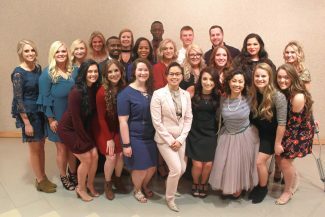 The 2017 fall nursing class from left to right: (front row) Holly Hottinger, Sydney Henry, Mara Stockemer, Thu Phan, Natalie Rose Riedel, Dianna Dinh, Anna Burton, Tara Minx, (middle row) Delaney Adkins, Britney Wimberly, Bryce Williams, Mariah Harris, Morgan Pletcher, Kim Lummus, Mary Cracraft, Karen Giselle, Kimberly Wilson, (back row) Baylee Teague, Sarah Poe, Mackenzie Wills, Kenneth Kimani, Trey Unrau, Jesse Fuller.